Wearing: Bardot Ornate Floral Dress (here), Wittner leather studded boots, Arlington Milne leather clutch. It may not be Festival season but I still love everything about the apparel and styling! Boho prints, boots, tassels...ahh! Rule number one: Colour. Colour will always take you far, don't get me wrong I am more than happy to rock the monochrome look but there is something about colour that makes me happy and lifts my overall mood. It is different for everyone and by all means, I'm not imposing that you change your entire wardrobe if you're comfortable in your shades of black and grey. 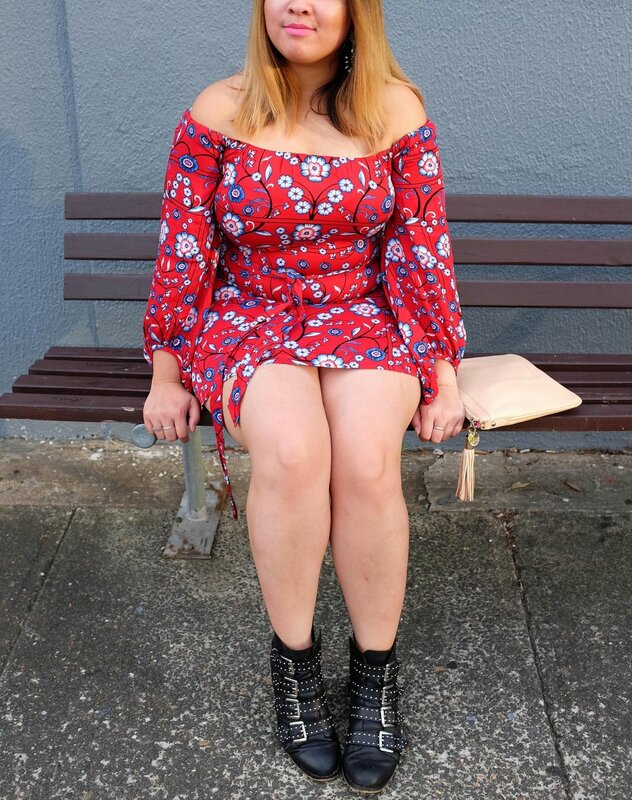 This red, floral printed off-the-shoulder dress is super easy to wear, I love how comfortable it and it's a piece that can be worn casual with a pair of studded boots for a little edge, or even styled with some gorgeous tassel heels. If you're looking for the pop of colour to enjoy the last leg of Summer, I recommend investing a pretty printed dress like this which will be perfect going into Autumn - thanks to the long puffed sleeve. I'm guilty of having a couple of long sleeved dresses which are always valuable in the cooler months but if you get a short sleeved dress, you can always grab your go-to leather jacket to wear upon your shoulders. So what are your thoughts of wearing boots with dresses? Would this be a look you'd try?